Riviera hotels selling out. Book now! Welcome to Riviera-Beaches, your guide to all the beaches of the French Riviera. 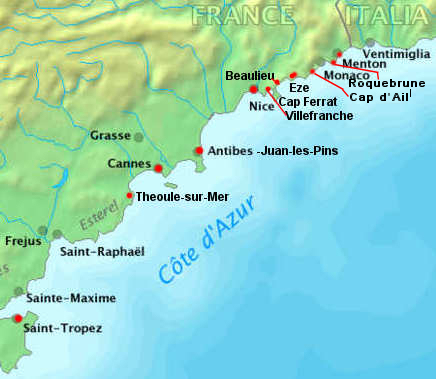 The French Riviera, or Côte d'Azur, is known for its spectacular coastline that stretches from Marseilles in the west to Menton in the east. It may be the world's most beautiful coastline and on these pages you'll discover all you need to know about its beaches. With pictures, videos and descriptions you can select the beach that is perfect for you and you'll get detailed advice about accessing each beach whether by foot, car, train or bus. You can plan your budget because you'll find out how much it costs to rent lounge chairs, umbrellas and other acoutrements. Gourmands will love the information and reviews of beach restaurants. And if you want to stay near the beach, no problem! You'll find out which hotels are closest to your favourite beach. So, plunge in and start planning your dream holiday on a French Riviera beach! Are you looking for breakfast on the beach? Family beaches? Sandy beaches? Public beaches? Use the search box below to find what you need.